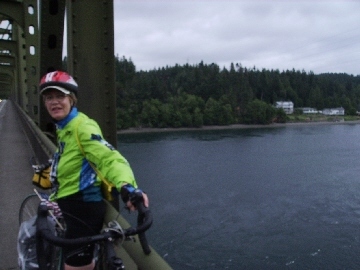 Our destination on the first day of this segment was Marc and Olivia's home between Poulsbo and the Hood Canal bridge. 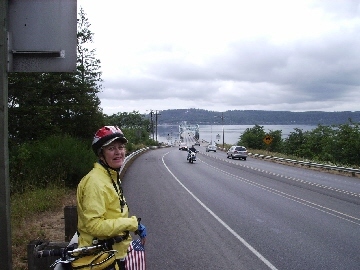 Route: state highway up the middle of Bainbridge, side rode along shore to Poulsbo (highly recommended), Big Valley Rd north out of Poulsbo (highly recommended). 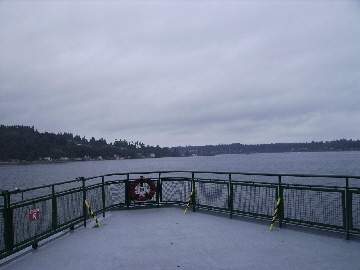 Approaching Bainbridge Island on the Seattle-Bainbridge Is ferry, the first of 11 Washington State Ferry rides. When we arrived, it was raining. By the time we got our rain gear on, it stopped. This was the only rain we saw the whole trip. 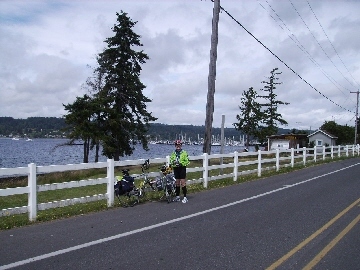 Poulsbo Harbor. The old part of town featuring its Norwegian heritage is near sea level. The urban sprawl part is up a steep hill. 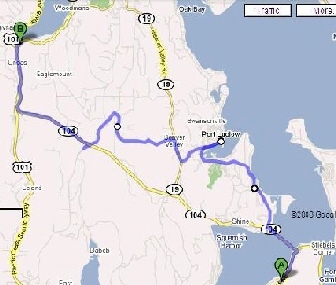 Today's ride to Discovery Bay would have been short had we stayed on the highway; so we took a detour. Valley View Motel - Discovery Bay. 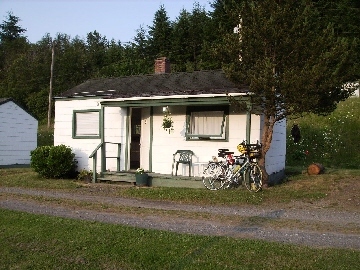 Nice cottage with complete kitchen and great view of Discovery Bay. Enjoyed pizza and beverage on the front porch over looking the Bay. Only problem: place had not been vacuumed. The absentee owner who was visiting, seemed to have no control over the manager. 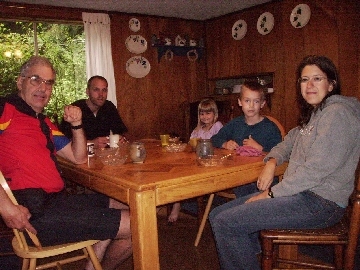 But she had taken Jeanine on a sightseeing tour and given us salad fixings for supper and eggs and bread for breakfast; so Jeanine didn't have the heart to complain. Discovery Bat at near high tide. The afternoon before, this was all mud flat. 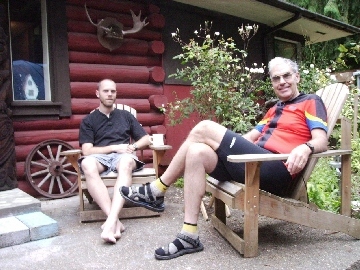 Today's ride to Lloyd and Carole's in Port Angeles was the longest of the tour, 43 miles. 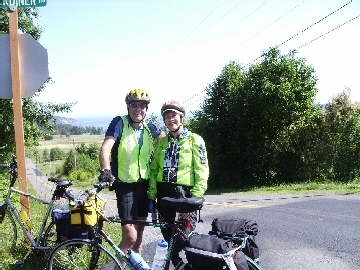 Generally, we followed US 101 the whole way; but early on we spent most of the time on quiet rodes paralleling it. 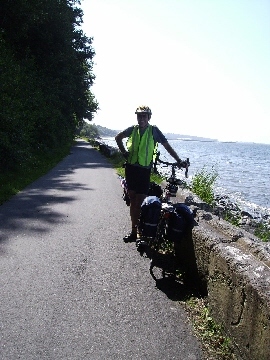 Later, after Blyn we were on the Olympic Discovery Trail through Sequim to Port Angeles. 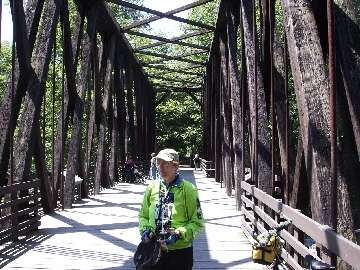 The trail is a combination of paved railroad grade trail, quiet country roads, a little dirt paths, and several impressively restored railroad bridges. 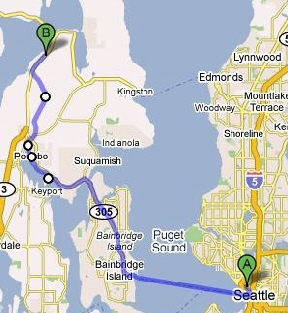 Sequim and the area half way to Port Angeles is flat, but made up for it with a strong west wind. The trail enters downtown Port Angeles at the ferry dock. Between here and our destination on the plateau above downtown was a short, steep hill. 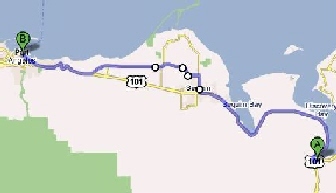 Dungeness Peninsula - between Discovery Bay and Sequim (pronounced SQUIM). 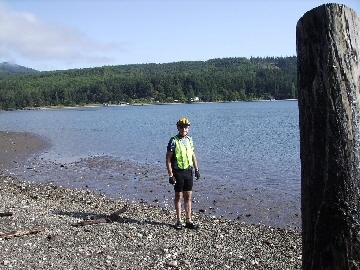 The Strait of Juan de Fuca is in the background. 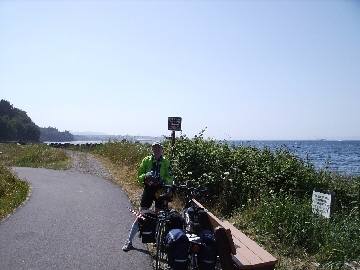 Olympic Discovery Trail along side the Strait of Juan de Fuca east of Port Angeles. Olympic Discovery Trail. Closer to Port Angeles the trail is marred by a long, rocky detour around a former paper mill that was being cleaned up by the environment people. The work has been going on for many years; and a section of the paved parking lot could easily have been fenced off to accommodate the trail.